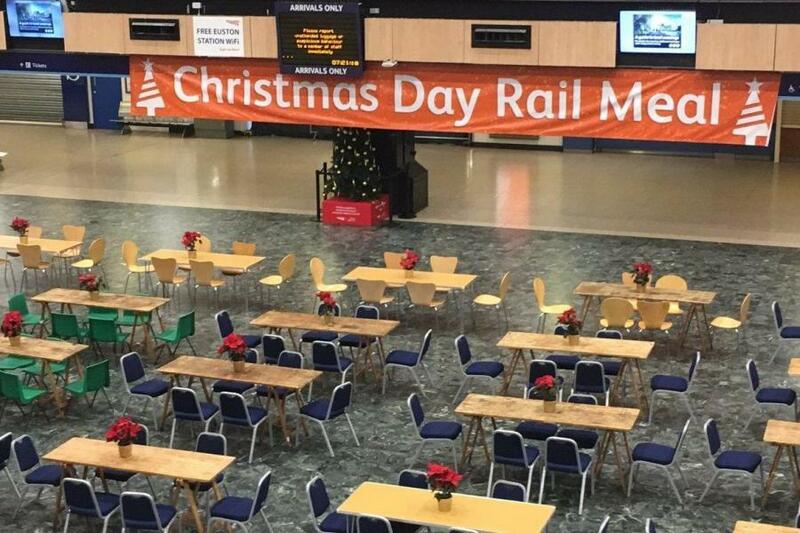 London Euston station hosted a full Christmas lunch for 200 homeless people today. Volunteers worked overnight after the last train left the busy transport hub on Christmas Eve. The station’s concourse was lined with tables and chairs before guests arrive for food, clothes and toiletries at 11am. About 45 Network Rail volunteers along with charities St Mungo’s and Street Kitchen helped out at Euston on Monday. Those prepping the four-course meal of smoked salmon, soup, a festive roast and Christmas pudding have been tweeting their efforts using the #EustonChristmas hashtag. Almost 50 different businesses and organisations donated items including food, drinks and thermal clothes, to the event. Steve Naybour, a Network Rail engineer who helped out, said guests would have a "great feast”. "We're going to give them the best day that they probably didn't expect a few days ago," he told the BBC. He was one of four employees at Network Rail who suggested Euston be turned into a shelter for the day. Mr Naybour, who goes back to work on Boxing Day, said he had been "blown away" by the generosity. Beth Nordon, community and events manager for St Mungo's, said: "Many people become homeless because of relationship breakdowns so Christmas can be a particularly lonely time for some of our residents."